Refer to the diagnostic station Instruction Manual for proper starting system diagnosis procedures. To ensure a complete and thorough diagnosis, the battery, starter motor and generator test segments must be done as a set from start to finish. Perform the starting system test with Multitasking battery and electrical diagnostic station GR8-1200 NI. For details and operating instructions, refer to diagnostic station Instruction Manual. CHARGE BATTERY>>Perform the slow battery charging procedure. (Initial rate of charge is 10A for 12 hours.) Perform battery test again. Refer to diagnostic station instruction manual. REPLACE BATTERY>>Before replacing battery, clean the battery cable clamps and battery posts. Perform battery test again. Refer to diagnostic station instruction manual. If second test result is вЂњREPLACE BATTERYвЂќ, then do so. Perform battery test again to confirm repair. Check that the starter motor operates properly. Does the engine crank normally? YES >> GO TO 3. Check that the engine starts. NO >> Perform further diagnosis of engine mechanical or engine control system. Refer to EM and EC sections. Once resolved, perform battery test again. Check that the starter motor operates. Does the starter motor turn? YES >> Check ring gear and starter motor drive pinion. Once resolved, perform battery test again. Compare the engine coolant temperature and verify the cranking voltage is within specifications. Is the voltage less than the specified value? YES >> GO TO 7. Does the starter motor turn smoothly? YES >> Inspection End. Check вЂњBвЂќ terminal circuit. Refer to STR-26, "Diagnosis Procedure". Is вЂњBвЂќ terminal circuit normal? YES >> GO TO 8. Check вЂњSвЂќ connector circuit. Refer to STR-28, "Diagnosis Procedure". Is вЂњSвЂќ connector circuit normal? YES >> GO TO 9. Check that the engine can be rotated by hand. Does the engine turn freely by hand? YES >> Replace starter motor. 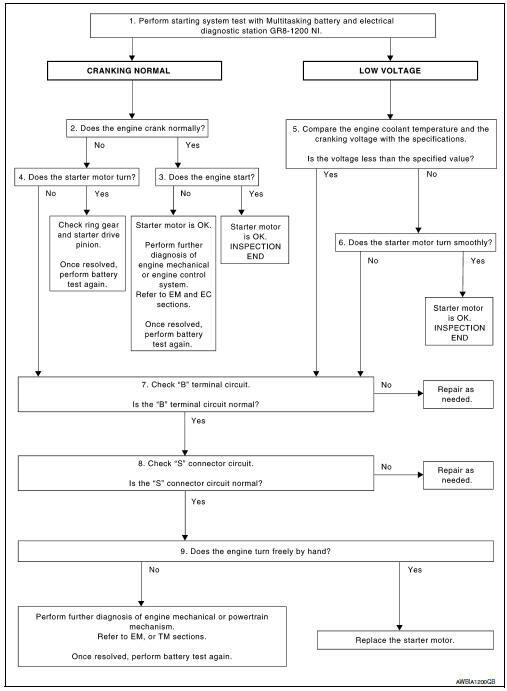 NO >> Perform further diagnosis of engine mechanical or powertrain mechanism. Once resolved, perform battery test again using Multitasking battery and electrical diagnostic station GR8-1200 NI. Refer to the diagnostic station Instruction Manual for proper testing procedures.